Parasitology is an important specialist journal covering the latest advances in the subject. It publishes original papers on all aspects of parasitology and host-parasite relationships, ranging from the latest discoveries in biochemical and molecular biology to ecology and epidemiology in the context of medical, veterinary and biological sciences. 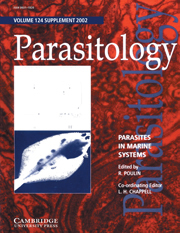 Each year, the proceedings of the symposia of the British Society for Parasitology are published as a supplement. An additional specially commissioned supplement is also included annually.